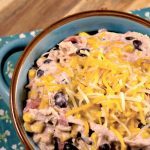 Cream cheese and ranch seasoning mix make this recipe for Crock-Pot Creamy Chicken Chili a smooth yet hardy variation on chili that the whole family will love! Chili is a staple dinner in our home. We eat chili in the cold fall and winter months probably about once every two weeks. But we don’t like to repeat the same dish too often. 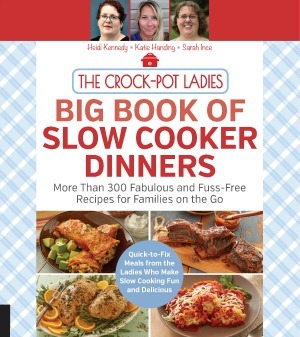 Thankfully I am a food blogger, double thankfully I am a slow cooker food blogger and triple thankfully chili is kind of one of those dishes when you think about slow cooker meals. Needless to say, it makes my job as a mom feeding her family a little easier if everyone LOVES chili. 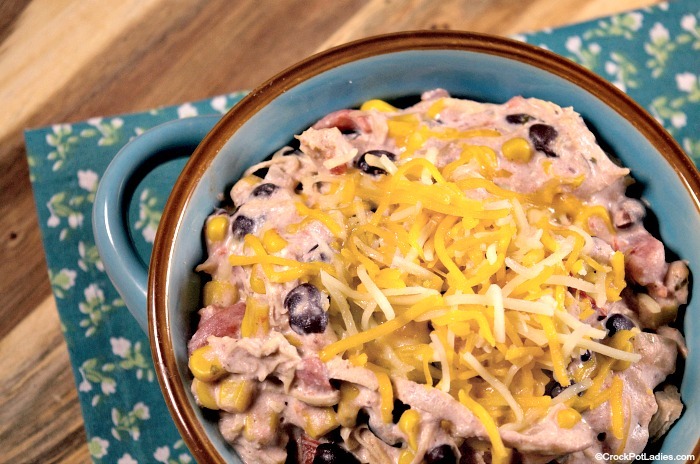 This chicken chili version has cream cheese to make it nice and creamy, ranch dressing mix (store bought or you can use homemade ranch dressing mix recipe to make it a little healthier). And then I used chicken instead of the traditional beef or pork that one would find in a more traditional chili recipe. The advantage of using chicken (or turkey!) instead of say, ground beef is that you don’t have to pre-cook the chicken. Which is super nice when you need to get dinner in the slow cooker and run out the door, which let’s face is so many of our mornings. You can even use frozen chicken in this recipe which is REALLY nice because I don’t always have time to thaw out chicken. I decided to use black beans in this recipe simply because that is what I had on hand in my pantry, but feel free to use your favorite kind of beans. Kidney beans, navy beans, pinto beans…they all will work great. Our family enjoyed this recipe so much that next time I plan on doubling the recipe so that we can have leftovers for lunch for a few days. 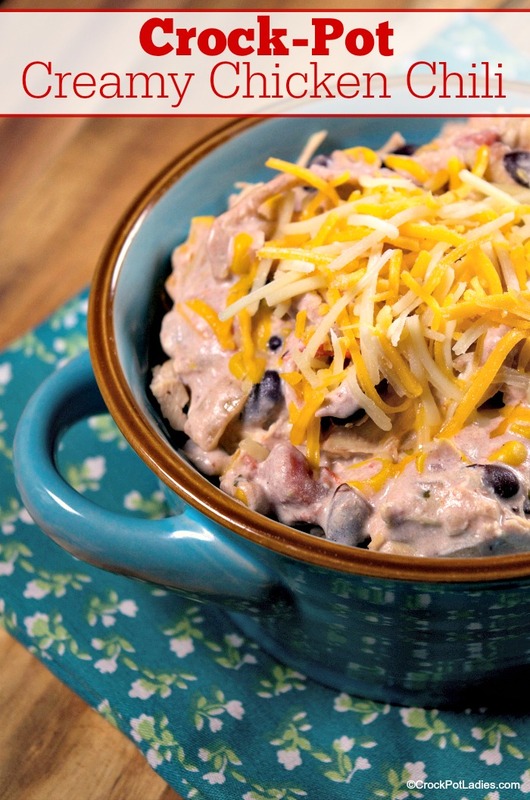 Chicken, cream cheese and ranch seasoning combine in this creamy and hearty chili recipe that everyone in the family will adore. Add chicken to the bottom of 6 quart or larger slow cooker and add remaining ingredients on top of chicken. Cover and cook on HIGH for 3 to 4 hours or until the chicken is cooked through. 30 minutes before serving, shred the chicken meat into bite sized pieces and stir the chili well to mix the melted cream cheese into the chili. Spoon chili into bowls and top with your favorite chili toppings. Serve with tortilla chips, shredded cheese, sour cream and avocado if desired. Can you please tell me how you calculated the weight watchers freestyle points to be 3? I’m new to this and when I used the ww calculator I get 11 points. Thanks for your help. Hi Linda, each recipe where there are Weight Watchers points calculated I personally run through the recipe builder on the Weight Watchers website. Everything but the ranch dressing mix and Neufchâtel cheese is zero points. So you have 46 points for the entire recipe. Per serving that calculates out to 4 points per serving (not 3). Which I have edited in the recipe because I must have made a mistake when entering that data in the blog. So sorry about that. But still not 11 points so still a pretty healthy option! Chili to me is a liquid base and this seems thick, almost like a dip…wondering if adding chicken broth would be more of soup like consistency??? But sounds amazing! You could thin it out some with some chicken broth.